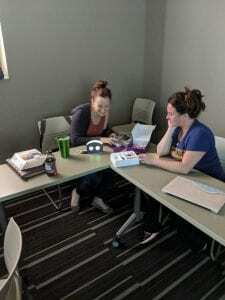 In the Spring 2018, several professors, including Theresa McDevitt and Elin Woods (IUP Libraries), Stephanie Taylor-Davis (Food and Nutrition), Veronica Paz (Accounting), Crystal Machado (Professional Studies in Education), Matthew Vetter (English), and Waleed Farag (Computer Science) secured an ACPAC grant to obtain 12 “‘Rule Your Room’ LittleBit Kits” to foster community and team building across IUP. 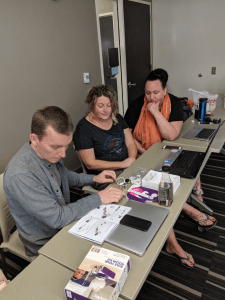 The variety of departments represented by these faculty demonstrates the capability of materials like these inventor kits to sponsor learning across disciplines via various modalities. Who would have thought an English class could share a pedagogical activity with a class in Accounting? In the following, authors Dr. Veronica Paz and Dr. Matthew Vetter reflect on their experiences using the LittleBits invention kits to help focus student engagement on team dynamics and community building. Our reflections also connect to broader conversations regarding educational developments toward active learning, maker movements, and creative and agentive uses of new material, technologies, and media. Each kit contains seven Bits (i.e., power, dimmer, sound rigger, Makey Makey Bit, bargraph, buzzer, servo & hub), materials and accessories (i.e., 9V battery & cable, screwdriver, adhesive shoes, mechanical arm, servo mount, alligator clips, mounting boards, micro USB cable, templates), and instructions for 8 inventions along with access to thousands of invention plans online. In the Fall 2018 semester, I decided to use the LittleBits inventor kits to foster team building and allow my ACCT: 431 Auditing and ACCT: 432 Forensic Accounting students to speak to one another. We accountants are less about talking and more about number crunching. I used the LittleBits “Rule Your Room” kits in the first and second week of class to break the ice and get the students to evaluate one another while working on teams. After obtaining the grant money and seeing how my colleague Matthew Vetter used the kits with his doctoral students when I attended his Technology Day presentation, the wheels started turning and I wanted to give them a try. Even us left brained accountants can be creative and fun, as long as we are not cooking the books! Pun intended. In previous semesters, students have complained about the inequality of work completed by team members and their group projects. This was my solution to their dissatisfaction. The students enjoyed the activity’s focus on an alternative mode of community-building. Students also appreciated being able to create something different than traditional financial statements. To see additional photos of my use of this activity, check out the Microsoft Sway presentation I created (https://sway.office.com/6ajGFtpQzSOls5T5?ref=Link) from these classes. 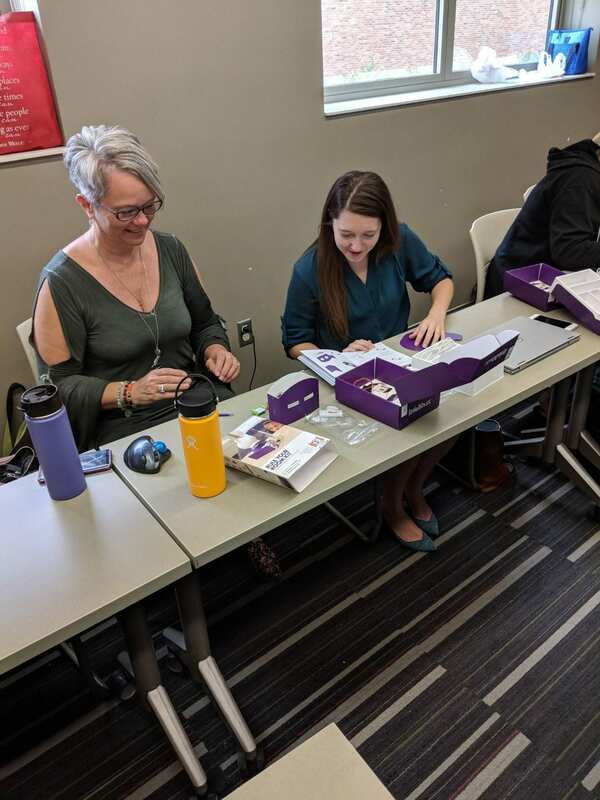 The auditing students were presented the Little Bits Kits to help them select their audit team members, which will be their group members for the semester. In the summer of 2018, I taught a doctoral course in Digital Rhetoric, a special topics, research-oriented course, and part of the English Department’s Ph.D. program in Composition and Applied Linguistics (CAL). One of the readings in this course asked those of us who teach college composition to consider how we might expand our definitions of what writing can entail in the 21st century. These authors asked us to consider, “Is 3D printing a type of writing?” If teachers are already asking for multimodal compositions that engage and include images, video, audio, and text, for instance, where do we draw the line between writing and other forms of meaning-making and communication? In that same vein, I asked my students to consider this LittleBits inventor/engineering kit: Is this a type of composing or meaning-making? Beyond this particular thought-experiment, we also focused our engagement with LittleBits in more practical ways, as current and future teachers of English, to think about how these kits could be used in undergraduate contexts. As evidenced in the photos (above), students came together in a dynamic and kinesthetic learning experience to work on LittleBits inventions. In the reflective discussion held immediately after students worked with the LittleBits kits, we made a number of realizations about specific pedagogical applications. In particular, my students and I found that LittleBits would be a great activity for an “icebreaker” (at any level of education) on the first or second day of class. LittleBits could also be used as an effective tool for building community or helping students to better understand group and collaborative dynamics. We also recognized how LittleBits would be a useful way to prompt undergraduates to think about and perhaps identify their own learning style. Finally, we viewed the constructive act of building an invention as an interesting visual metaphor for thinking about structure, form or process in a writing assignment. The Center for Teaching Excellence serves as a repository for the 12 LittleBits kits that were purchased in spring 2018 using ACPAC Technology Innovation Grant funding. All faculty may sign out and use the kits. Other IUP staff may use the robots by permission of either the CTE Director or Theresa McDevitt. Students are not permitted to sign out the robots. Robots may be signed out for 14 days (renewable) and must be returned by the last day of classes each semester/term. For more information, visit the Center for Teaching Excellence in Stabley 103 to check out these kits and access the Library Guide. Handy, J. (2013). A Connection Problem: Using Legos to Teach Parallelism. Teaching English in the Two Year College, 40(3), 308. Hecker, L. (1997). Walking, tinkertoys, and Legos: Using movement and manipulatives to help students write. The English Journal, 86(6), 46-52.Available here. Moreau, C. P., & Engeset, M. G. (2016). The downstream consequences of problem-solving mindsets: How playing with LEGO influences creativity. Journal of Marketing Research, 53(1), 18-30. Available here. Rhodes, M. (2011). Legos Build the Way to Successful Process Analysis Writing. Teaching English in the Two Year College, 39(1), 78.